Adrift in a dinghy, Edward Prendick, the single survivor from the good ship Lady Vain, is rescued by a vessel carrying a profoundly unusual cargo – a menagerie of savage animals. Tended to recovery by their keeper Montgomery, who gives him dark medicine that tastes of blood, Prendick soon finds himself stranded upon an uncharted island in the Pacific with his rescuer and the beasts. Here, he meets Montgomery’s master, the sinister Dr. Moreau – a brilliant scientist whose notorious experiments in vivisection have caused him to abandon the civilised world. It soon becomes clear he has been developing these experiments – with truly horrific results. One of the authors who worked at the foundation of my love for speculative fiction is H.G. Wells with novels like “The Invisible Man”, “The War of the Worlds” and “The Time Machine”. Recently, however, I noticed that one of the best known novels of H.G. Wells, “The Island of Dr. Moreau”, skipped my attention. The story starts with a small presentation in which we are introduced to the journal of Edward Prendick, where he relates a strange story of his life. I have to admit that sometimes I miss such type of telling a story, through a journal or journal entries of the main protagonist. It is still a first person perspective, but it is one that creates a certain bond between the reader and the character. Anyway, the events in Edward Prendick’s are set in a Pacific island where he ends up after he is recovered from a shipwreck. 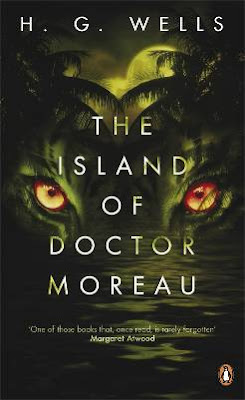 On this island, Edward Prendick will face the horror of the Dr. Moreau’s experiments and his shocking results in a way that will change him forever. At the time when the novel was written the medical knowledge and science weren’t as advanced as in our modern days, but I still had a strange feeling reading H.G. Wells’ novel. It is true that the experiments described in the novel don’t sound as terrible or plausible to me, with my very little medical experience, but transposed in our times can lead to a sense of dread. The medical science, and not only this, developed a lot since 1896 when “The Island of Dr. Moreau” was published and the vivisection process will not horrify as it did then, but I wondered what could happen now with a same disturbed mind and the possibilities offered by the contemporary medical techniques. Anyway, H.G. Wells doesn’t induce a sense of unease in his story only through the vivisection results of Dr. Moreau, but also through constant moments of tension managed through screams and noises, chases through woods and darkness and the setting, a remote unknown island that didn’t offer much chances of escape. At the scientific level, H.G. Wells’ novel might not be as visionary and shocking as it was in 1896, but at the philosophical level remains as fresh as it was then. Although at the time when I finished the novel not many of its layers revealed to me, days later while thinking back at “The Island of Dr. Moreau” more and more questions raised inside my mind. The desire of the man to become a god is put fully in motion here, with a creation process, a code to follow and a punishment for failing that code. The regression to violence is not always due to a vivisection process, but a constant unexplained result of human behavior. Questions regarding religion, morality, society and humanity can be seen in H.G. Wells’ novel and they will not go away with ease. H.G. Wells’ “The Island of Dr. Moreau” is considered one of the speculative fiction masterworks, deservedly so, and although I believe that the novel is not as strong as it was over 100 years ago when it was published it still can hold its ground among the contemporary works. I think it's difficult sometimes to read a book that was written many years ago and see it as it was seen when it was published. We are a very graphic society these days and not a lot really surprises us or grosses us out any more. Many films and books are full of blood and gore. Very interesting to hear your thoughts, thanks for the review. I think that we forget too often good books which have been written in the past. So I appreciate your good review which is the right step to support books against vanishing in oblivion. Remembering reactions against vivisection in the sixties the book is still a little bit actual. From the other side this kind of animal physiologists is nearly extincted, few restants are too find back in university courses. I think you can recognize the age of the writing at the structure of the novel. In a modern novel I would expect soon an end after the dead of Moreau which I call the climax. But here the story still goes on for several chapters, so that I wondered if their came an end at the story.